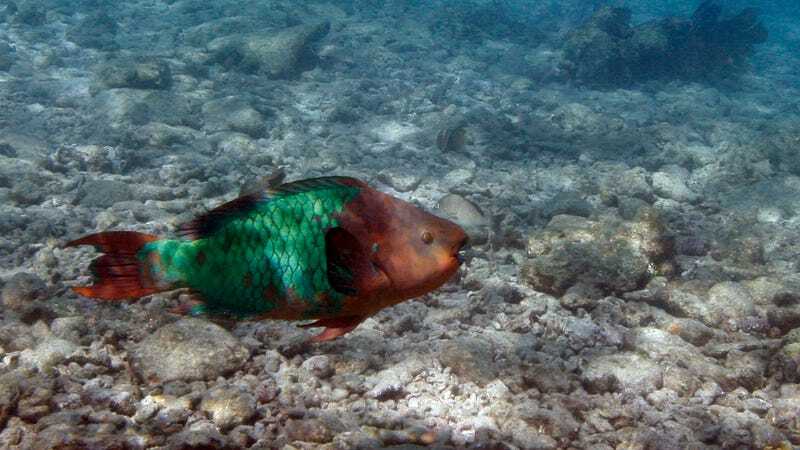 A parrotfish swims over a dead coral reef in the Florida Keys National Marine Sanctuary near Key West back in August 2008. Skincare aficionados and beachgoers alike may have to think twice before slathering on their favorite sunscreen if they’re headed to Key West, Florida. The city’s officially regulating what sunscreens are allowed in its waters—all in the name of saving its beloved coral reefs. The Key West City Commission voted 6-1 Tuesday to ban the sale of sunscreens that contain the ingredients oxybenzone and octinoxate starting in 2021, reports the Miami Herald. Evidence suggests these chemicals can harm the development of corals and make them more prone to bleaching. When corals bleach, they essentially start to die because they’ve lost the algae they rely on to produce food. Florida’s corals form the only shallow-water reefs off the coast of the continental United States. They’ve been suffering from disease, and, like reefs around the world, face the dual threat of rising ocean temperatures and acidity. Chemicals from sunscreens that harm corals just worsen their situation. The Florida Senate is considering a similar bill, so at least Key West wouldn’t be alone statewide in this move. But it isn’t alone now: Hawaii passed a similar ban in May 2018, becoming the first state in the nation to do so. Palau became the first entire nation to follow suit in November. Corals need all the help they can get. 2019 might be the year of living coral, but that’s not enough to protect these mysterious marine creatures we still know so very little about.